For this week’s look at past Albion games, I was tempted to take you back to a cold Tuesday night in October, 2008, when Leicester City came to Withdean on their way to the League One Championship. We were two goals down at half-time but a brilliant second half saw us win 3-2, thanks to an own goal and two from Bradley Johnson. Instead, it’s back to 1994 and a pairing in the Coca-Cola Cup second round. Leicester City were a Premier League side and no-one gave us a chance of upsetting the formbook. We had started the season well and in Kurt Nogan, had a striker in a rich vein of form. His nine goals had taken us to ninth in Division 2 but the 11,481 crowd in the Goldstone for the first leg, turned up more in hope than expectation. A goal from Nogan gave us a slender lead at half-time and some dogged defensive work kept out the Leicester players in the second period. The return leg was two weeks later and just four days before the trip to Filbert Street, we were thrashed 3-0 at Huddersfield Town. Despite this, we took our usual large following to the East Midlands and the travelling fans were rewarded with a fantastic night. We extended our aggregate lead with an absolute screamer from Stuart Munday and this seemed to knock the stuffing out of a Leicester side that must have thought we there for the taking. Nogan scored a second near the end to seal the tie 3-0 on aggregate, but the drama wasn’t quite over. With just a couple of minutes to go, Jimmy Case was waiting for Jeff Minton to come back on the field after being told by the referee to remove his necklace. The Leicester crowd were not happy and the ref told Case to hurry up. Unfortunately, Jimmy (who was a little deaf) wasn’t wearing his hearing aid and ignored the plea. 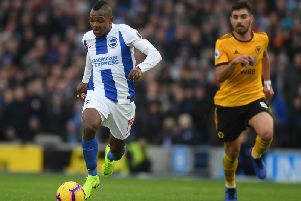 He had already been booked and after receiving a second yellow for time-wasting, became probably the only Albion player to be sent off for being deaf! That goal was Nogan’s 60th for the Seagulls, in only his 100th appearance. It turned out to be his last, as the scoring touch deserted him. Speculation was rife about a possible move to Liverpool and other clubs. He ended up moving to Burnley in February, 1995, for a fee of £250,000. The result over Leicester was the start of a dramatic slump in fortunes for Albion, both on and off the field. We stayed up in 1995, but the following seasons saw successive relegations and the club very nearly going out of business.